When you coach the varsity football team at Calvert Hall, the biggest win of the year, if you are fortunate enough to get it, always comes on Thanksgiving morning. 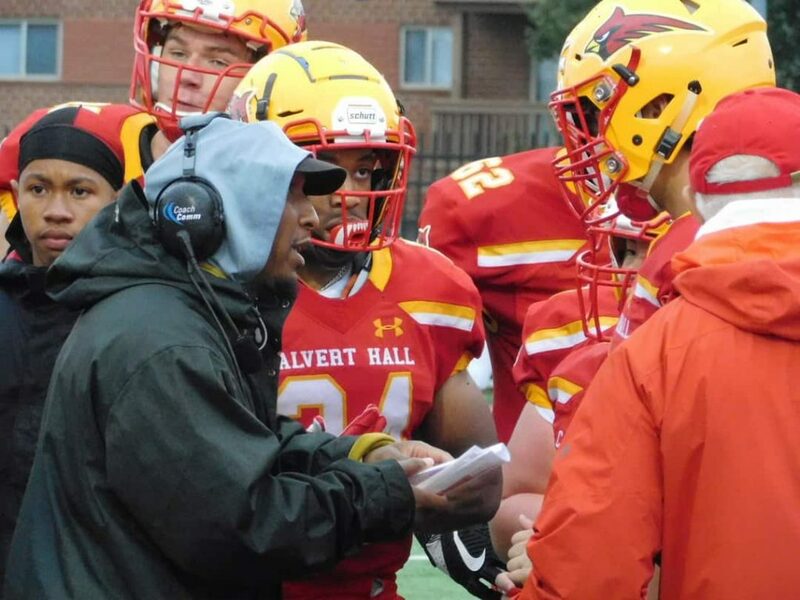 Turkey Bowls, as well as playoff and championship games aside, Donald Davis picked up one of the biggest wins of his tenure at Calvert Hall, on Saturday, when his Cardinals knocked off Henry A. Wise, 19-14, in the rain at The Hall. Wise, a perennial 4A state power from Prince George’s County came in with a state best 43 game streak and the victory earned Davis the honor as the Baltimore Touchdown Club Coach of the Week. Davis said it is a victory he and his players will cherish. Donald Davis coaches up his Cardinals during their big win over Wise. 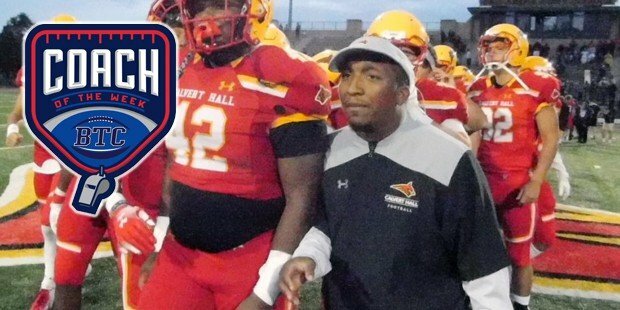 Calvert Hall nearly ended the Wise streak a year ago when they went on the road and dropped a heart-breaking 15-13 decision in Prince George’s County that extended the Pumas’ run of consecutive wins to 30 at that time. According to the Davis, his returning players had the game in mind all summer. Davis, like all successful head coaches relies on talented support staff and assistant coaches. He shares his BTC honor with them and took a moment to reflect on each of them. Not only does Davis share this award with his coaches and players, he gives credit to everyone at Calvert Hall. Finally, Davis stressed the importance of the work done by the Baltimore Touchdown Club in support of high school football in the state. Pictured above: Donald Davis leads his team off the field after the Cardinals defeated Henry A. Wise, 19-14, on Saturday, ending the Pumas’ 43-game winning streak.